The museum is closed during the month of January and on all state holidays. The museum houses items from Tom Mix’s personal collection, providing a glimpse into the life of one of Oklahoma’s most colorful figures. Those too young to remember the man and his talent are sure to find his story as fascinating as those who watched him ride across the movie screen years ago. Tom Mix was born on January 6, 1880, in Mix Run, Pennsylvania, to Edwin and Elizabeth Mix. After a stint in the army, Mix moved to Guthrie, Oklahoma Territory, where he worked odd jobs. At various times he worked as a bartender, a hand with Zack Miller’s 101 Ranch, and for a short time in 1911 served as marshal in Dewey, Oklahoma. While working for the 101 Ranch, Mix began his movie career. He married five times and had two children: Ruth, born July 13, 1912, to Olive Stokes, and Thomasina, born February 12, 1922, to Victoria Ford. Tom Mix died in 1940, in a car accident on a highway between Tucson and Florence, Arizona. Tom Mix’s movie career spanned twenty-six years from 1909–35. At various times he was under contract with the Selig Polyscope Company, Fox Film Corporation, Film Booking Office, Universal, and Mascot. In all he made 336 feature films, produced 88, wrote 71, and directed 117. Mix made nine sound feature films and the fifteen-chapter serial Miracle Rider. His movies were famous for quick action and daredevil stunts. Tom and his horse Tony performed their own stunts. Mix was a superb athlete and kept himself in good physical condition. 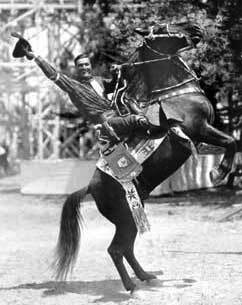 He pioneered many of the early movie stunts. No trick cameras or fake scenes were used because of the limited shooting budgets. Misinformation and lore seem to abound about Tom Mix. Some of the stories were created as publicity for the studios, others Tom Mix spread himself, and from there the stories multiplied until the truth became hard to find. To learn more, visit the Tom Mix Museum website at tommixmuseum.com. This property is managed by Tom Mix Museum, Inc.